Monique McGowan sharpens a No. 2 pencil, straightens her posture and sharply slants her notebook to prepare for her weekly lesson in cursive. She and other third graders at Horrall Elementary School have perfected ascenders and descenders, and their letters' tails and legs hit the appropriate base lines - even the tricky capitals G, Q and S.
But Monique, who plays games on her dad's laptop at home, says she'd rather punch a keyboard than write cursive. "Computers are better," the 9-year-old says, blonde pony tail bobbing behind her. "With typing, you don't have to erase when you make a mistake. You just hit delete, so it's a lot easier." Such attitudes are worrying to a growing number of parents, educators and historians, who fear that computers are speeding the demise of a uniquely American form of expression. Handwriting experts fear that the wild popularity of e-mail, instant messages and other electronic communication, particularly among kids, could erase cursive within a few decades. At technology-savvy Horrall Elementary - where students take keyboard lessons in third grade, precisely when they learn cursive - Monique's teacher, Ed Boell, is fighting the trend. He refuses to give extra points when students turn in laser-printed homework assignments with fancy computer fonts, and he urges kids to send handwritten letters to parents and friends. The students eagerly shout, "No!" and return to loops and curves. Since switching from print to the more free-flowing handwriting earlier this year, Boell's students are writing faster and more legibly. But in many other classrooms, traditional cursive is on its way out. So many students have trouble with it that teachers are increasingly adopting a simpler style known as Italic or "print cursive." Online discussion forums for teachers estimate that as many as 7 percent of third graders are using Italic, whose printed letters are "semi-connected" with small tails. It's not as loopy or slanted as the 20th-century style developed by Austin Norman Palmer and adopted as a standard in schools nationwide. Sue Bolton at Kings Mountain Elementary School in Woodside teaches the Palmer Method to her second- and third-graders, but many of her students turn in homework with touches of Italic they've picked up from siblings or other teachers. "They've got good handwriting now, and they love cursive," Bolton says as her students filter in from recess. "But it wouldn't surprise me if they just walked around with their little keyboards and typed everything a few years from now." According to the National Telecommunications and Information Administration, 90 percent of Americans between the ages of 5 and 17 use computers. It's not uncommon for kids to type 20 or 30 words per minute by the time they leave elementary school. The trend pervades Silicon Valley, where many schools have computer labs and kids gravitate toward careers in the computer industry. 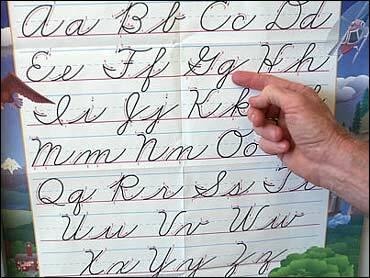 But some say students' struggles with cursive have reached alarming proportions nationwide. Michael Sull, a 54-year-old artist in Overland Park, Kan., says today's third graders have not developed proper forearm and hand musculature, seated posture or mental discipline. The former president of the International Association of Master Penmen, Engrossers and Teachers of Handwriting says keyboards, joysticks and cell phone touch pads have ruined kids' ability to hold a pencil properly, let alone write legibly. "Penmanship these days is thought of as a vestigial organ because it's not translated into dollars, like computer skills," says Sull, who honed his writing skills under Paul O'Hara, a pre-eminent 20th century penman. "If you need to relay information immediately and have just a half-second to grab anything, maybe just a napkin, penmanship is so valuable," Sull says. "It doesn't rely on batteries or power. It's like breathing - it's always with you." Parents who pride themselves on their penmanship often bemoan their children's cursive - particularly when they can't read sloppy notes or notice that their kids increasingly turn in homework via e-mail. Many adults pine for a return to the Palmer Method or even its fancier predecessor, Spencerian. "Cursive was so character-defining when I was in school," says Amy Greene, whose 9-year-old daughter and 11-year-old son prefer keyboards to cursive in their Palo Alto classrooms. "The way you wrote something was considered part of your inner being, your core, your worth. ... Now it's considered an anachronism." Cursive's ultimate fate is unknown. Few statistics mark its demise. Some passionate penmen say it won't go the way of the feather quill pen, noting that the style survived electric typewriters. Nabeel Khaliq, an 11-year-old sixth-grader from Mississauga, Ontario, comes from a family of cursive enthusiasts and can't imagine not writing. He took first place in his age category in the 2002 World Handwriting Contest, sponsored by the Albany, N.Y.-based Handwriting for Humanity club. "It must be a natural thing that my family has, except for my brother," Nabeel says. "I write all of my rough drafts by hand." Still, Nabeel's cursive is rivaled only by his typing. He types 40 words per minute - he was the fastest typist in fifth grade, a close second this year to a classmate who hit 50 words per minute. "I e-mail my cousins in Pakistan and chat on MSN," Nabeel said, referring to Microsoft's popular instant messenger service. "If I had the choice, I'd rather do it on the computer."